The Firefox web browser is still perceived by many as a RAM eater and a program that pushes RAM usage on many configurations to the limit. When you analyze that you may come to a different conclusion though. Lifehacker recently ran some - limited and non scientific - tests with the result that Chrome and Internet Explorer used both more RAM than Firefox. The developers of Firefox have started to implement features in the browser to improve its memory usage and performance. Among the features introduced is one that prevents the loading of all tabs during session restore on browser start up. This can speed up browser start up considerable and reduce the initial RAM use as well. A very similar feature is planned for upcoming Firefox versions. The developers plan to integrate a feature into the browser that unloads tabs in the browser after an inactivity period. This would free up memory but also mean that it would take longer to activate the tab again. If you are like me you have some websites open in tabs for safe keeping. Sites that you do not want to add to your bookmarks. I do that a lot for sites or software that I want to write about. The Firefox add-on Dormancy adds the future Firefox feature to current versions of the browser. The developer states that it should be considered an experimental add-on that could cause issues on some systems. The add-on unloads tabs after five minutes of inactivity. Firefox users can change the interval in the Firefox about:config configuration, which is a highly unusual place for configuration modifications. The extensions.dormancy.TabDormancyAgeMs preference defines the time tabs need to be inactive to be unloaded, the preference extensions.dormancy.TabCheckIntervalMs the checking interval. Both values are set to five minutes by default. The tab title of all unloaded tabs begins with data: so that it is always clear which tabs have been unloaded and which are still active. The extension works considerably well. Users may experience small lags from time to time. This happened infrequently on my Windows test system. How beneficial is the add-on? Firefox with nine active tabs and a handful of add-ons used about 280 Megabytes of RAM on the test system. With three tabs unloaded this dropped to 262 Megabytes. The gain obviously depends largely on the contents of those tabs The strange thing though is that you won't always see a gain, or reduction in RAM to be precise. It is usually easier to restart the browser for a larger reduction of RAM use by the web browser. The second issue that I have with the add-on is that it adds a feature to the browser that is going to be implemented natively at one point in time. If you are desperate and need RAM it might be worth a try, if not it is probably better to wait until it is implemented natively. Firefox users can download the Dormancy add-on from the official Mozilla Firefox add-on repository. Firefox is still a memory hog even by your sample. 256 MB of memory on a typical windows PC with 1GB memory, means a system that crawls. edit : “256 MB of memory” should have been 280 MB of memory….. Though I have been using Memory Fox for a couple of months and *think* it’s been helpful (yep, I do check firefox.exe in the Task Manager once in a while), I can’t claim to understand its approach all that well. The two add-ons don’t appear to use the same technique – maybe Dormancy is just plain better??? Firefox is the lightest and leanest browser. All other browsers uses far more RAM. I have 45 right now and sometimes have up to 65 or 70. People do things in different ways for different reasons. Don’t presume to think that your way is best or the only way that one should follow. I would not even know how to manage that many open tabs. Been using Firefox Ultimate Optimizer for ages and it seems to keep the Browser tame, in comparison to anything else out there! Here I thought that Mozilla was suppose to remedy the memory issue in FF 7! I’m one of the users that usually work on Firefox having more than 100 opened tabs at time. I’ve tried every memory optimization addon and it seems to me that they are only palliative treatments, at best, or hoaxs, at worst. Putting tabs to sleep is different. Dormancy addon could be very effective, but the only one review on firefox addons site is not very encouraging. Moreover, it seems to me that it is a clone of the Barttab addon. Bartab is wonderful. It is the only reason that prevent me to update from FF 3.6 to FF 7.0. Without tabbar, my experience when browsing internet would be a blood bath. For what I’ve said, I prefer to wait for an update of Bartab than try Dormancy. Anyhow, thank you for your article. oss, bartab still works in ff 7.0.1. use the compatibility reporter & mark it as working properly. There is some people that did report it does not work. I am among them. Me too miss Bartab functionality in FF 7. But read it from http://philikon.wordpress.com/2010/11/10/firefox-4-0b7-updates/ , can have instant Bartab behaviour. Set browser.sessionstore.max_concurrent_tabs to 0 at about:config do the magic. “Java Console” (incompatible in my case) eats lots of RAM even if that’s disabled. Deleting the addon reduces FF RAM usage. One has to do that manually, because the addon disables removal. All of them get added and enabled when Java is updated. However when Firefox use lots of RAM it has to be worked on that. It depends on the profile, at least it seems so. While I saw huge RAM usage on one profile it was low on another. On my system it’s not exceeding a certain amount. The addon seems to be promising since it unloads inactive tabs. This seems to be a use-case. Good that developers want to include that. FF should also clean more RAM when a tab is closed. As I may have mentioned,like Midnight I don’t find v 7 uses less memory. I have gotten in the habit of hitting File/Exit periodically during long web-browsing sessions, and re-opening;often I run CCleaner to clear cache in between.Like bastik, I have disabled several plug-ins, inc. Silverlight–does anything actually use that thing?? I run only three extensions. Having said that, I agree with the finding; Iron (Chromium) uses more RAM than Ff. 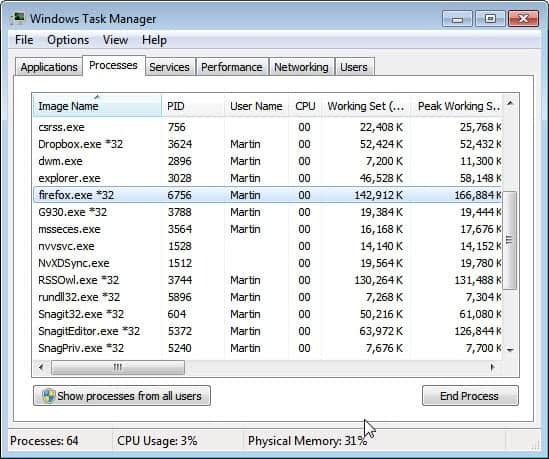 It is spread out in Task Manager but if you add up the usages, it can be a LOT. Eh… in good ol’ days under Win 98 in Opera 6 I could have 50-100 tabs opened. As for me, not browser but Flash is king memory hog. Youtube and flash games and banners drain most. Because in Chrome they are not blocked, I get about 60-100 mb RAM per tab according to Process Explorer. BarTab was good, but I’m from those who have issues with it since 4.0. Some pages just don’t load. A great news: the release 3 of BarTab has been release but an heroic user named dr. House. It works like a charm with FF 8!!! I remember back in the old days, when Firefox had only just started to make a name for itself, I’ve always been a power user so always used anything but IE, even if other browsers used the IE engine it was still far more reliable, I am afraid oepra is still a lightware similarly as utorrent is non bloatware for torrents. But seriously, I would love to dump Firefox now as much as I still like some of its addons, that is all I love it for. In total 3-4 addons to be precise. It is a CPU and RAM hog, but this was not always th ecase, now you need at bare minimum of 6GB DDR3 RAM to have Firefox open in background with one other program running. My 2GB DD2 system cannot handle Firefox and it often crashed due to non specific BSOD, random, hardwarw faults, when I close down Firefox the crashes do not occur and I still have at least 300-500MB free RAM. Annoying is the fact that it never unloads RAM, so following uninvestigated claims of others, I disabled all addons, made no difference so I uninstalled them all and made a clean install of windows vanilla and Mozilla Firefox when I bought some new HDDs and configured them to Raid 0 stripes. Still Firefox runs really slow with no addons, no skins, nothing, not even any toolbars or bookmarks so it it not my system or HDDs causing this but bloatware! So tried the same setup on a 4GB DDR3 laptop and it ran more smoothly even with 20-50 sites/tabs open using no ad/flash blocker which can use a lot of RAM. My personal verdict is that the dev team that volunteer may want to look back at their roots or origin of code and see if the core can be rewritten from scratch because all the updates have made sleekware into bloatware over the last couple years. When I open Firefox it uses 180-266MB RAM with no website loaded, apart from the default startup startpage. I am only still using FIrefox for its addons, and the fact that the devs do stand by OpenSource principles which seem to be consistent with. I will still use Firefox or at least have it installe don my systems until it improves or worsens, which ever one comes frist. Annoying thing is that it will not unload used RAM after closing tabs, so I have 8 sites open to brose the same topic and want to cross refence points or to learn additional info in more detail, not a crime is it….but Firefox will consumer up to 1GB of RAM with that many websites open, and the longer my browser is open the worse it gets until it crashes my system. When I do close Firefox down it takes 5 mins to unload the RAM it has kept hold of. it Needs to manage RAM better. When websites load CPu use is high but I guess you could say the same for all browsers even on Android and other Unix. Ok, so my machine with the 2GB RAM setup is 4.5 years old, but still Firefox definitely could be better, it cannot be that alone surely. It runs better on newer systems with more RAM. My exp firefox v4 was the worst version to date, all others seem ok with my fav being v3.5 still. I use th elatest these days though because they messed up v3.5 even with their last update to it. Gee. I am all the way up to Firefox 9.0.1 on a 3 GB RAM system. Admittedly, I rarely open more than 20 tabs. However I do run 78 add-ons (many quite minor, memorywise, I suppose). Plus a few Stylish and Customize Your Web styles, also Scriptish scripts, about two dozen in all. The browser very seldom stalls or exhibits any glitch at all (except while I have a malware scan going… yes, I do run scans in the background and put up with some slowdown). Can’t say the same was true when we were in the v3 Firefox series. Check out my user review titled “Works like gangbusters” (username blancheirving) on that Cnet page for Firemin. Other than being Beta, Dormancy lacks the ability to keep specific tabs loaded. If I keep Pandora in a tab and don’t use it for five minutes, is it going to be unloaded? Bartab (now Bartab 4, a hack which mostly works) allows manual and automatic unloading, as well as the whitelisting. Steve where did you get Bartab 4 from? The official Bartab add-on seems to be on hold.